Jaqueline (L), 25, holds her five-month-old twins, Laura (R) and Lucas at their house in Santos, Sao Paulo state, Brazil, April 20, 2016. Scientists struggling to unravel the mysteries of a Zika epidemic in Brazil hope they can learn from cases of women giving birth to twins in which only one child is afflicted by the microcephaly birth defect associated with the virus. Jaqueline Jessica Silva de Oliveira hoped doctors were wrong when a routine ultrasound showed that one of her unborn twins would be born with the condition, marked by stunted head size and developmental issues. "When I found out one of them had microcephaly, the ground fell out from beneath me," the 25-year-old said as she sat on the sofa of her home in the city of Santos. "You always hope that they will be born well, thinking that it could be a mistake by the doctor or in the ultrasound." Her son Lucas, who she holds in her arms, was born healthy in November. His twin sister Laura, whose head is visibly much smaller, requires regular treatment by a team of neurologists and physiotherapists in nearby Sao Paulo. With two young children already, Oliveira - who suffered the symptoms of Zika early in pregnancy - knew that life would be difficult with a child with developmental problems. Her husband, the family's only breadwinner, brings home just over 2,000 reais ($566) a month. "I thank God for giving her to me... I would never abandon her," Oliveira said, adding she had never questioned why only one child was born with microcephaly. "The doctors want to study them so they can see what protected Lucas in case it can help other children." Cases of only one twin developing a disease, such as rheumatoid arthritis or diabetes, have been widely documented. Medical research has focused on the interaction between the environment and genetic issues. Lucas and Laura are one of five cases of Zika twins scientists are studying in Sao Paulo. Five-month-old twins, Laura (L) and Lucas lie in their bed at their house in Santos, Sao Paulo state, Brazi, April 20, 2016. Similar cases of newborn twins - one with and one without microcephaly - caught the attention of doctors last year in northeastern Brazil, where the mosquito-borne Zika was detected for the first time in the Americas. The divergence in twins was one reason why researchers began to suspect the presence of a new disease. Brazil has since registered nearly 5,000 confirmed and suspected cases of microcephaly associated with Zika, according to the Health Ministry. The outbreak, and its impact on pregnant women, has cast a shadow over the upcoming summer Olympics in Rio de Janeiro on August. The Zika outbreak is affecting large parts of Latin America and the Caribbean, with Brazil the hardest hit so far. It is likely to spread to all countries in the Americas except for Canada and Chile, the World Health Organization has said. Last month, the U.S. Center for Disease Control and Prevention officially confirmed that infection with Zika in pregnant women is a cause of microcephaly and other severe brain abnormalities in babies. 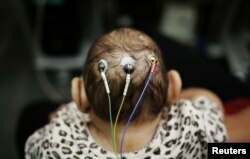 Five-month-old Laura undergoes a medical test at the University of Sao Paulo (USP) in Sao Paulo, Brazil, April 28, 2016. A team from Sao Paulo University studying the five cases believes they may hold clues to the nature of the disease itself and hope to have results from their investigation in a year's time. "The importance of these twins...is that they could give us some very important answers," said Mayana Zatz, director of the Human Genome Research Center at the university. "How can we explain that one of the twins was not affected: did they have a gene that protected them? Do they have a different genome that disposes them to the infection or not?" Recent studies have shown evidence of Zika in amniotic fluid, placenta and fetal brain tissue. Zatz said the placenta of one twin may be permeable to Zika, while the other may not, barring the virus from attacking the fetus. Another possibility is that the virus penetrates both placentas but that the neurons of one baby are resistant, while the other's are not. "The third possibility that we want to investigate is that certain genes predispose the child to microcephaly, and they are altered by the presence of the Zika virus," Zatz said, noting that around 15 genes are believed to govern microcephaly.